Concentrated Coffee Bean Flavor to flavor fresh roasted coffee beans. Over 100 gourmet coffee bean flavors to make your own signature blends. *These are very intense flavors. We recommend usage is 3% Click here for how to flavor coffee beans. 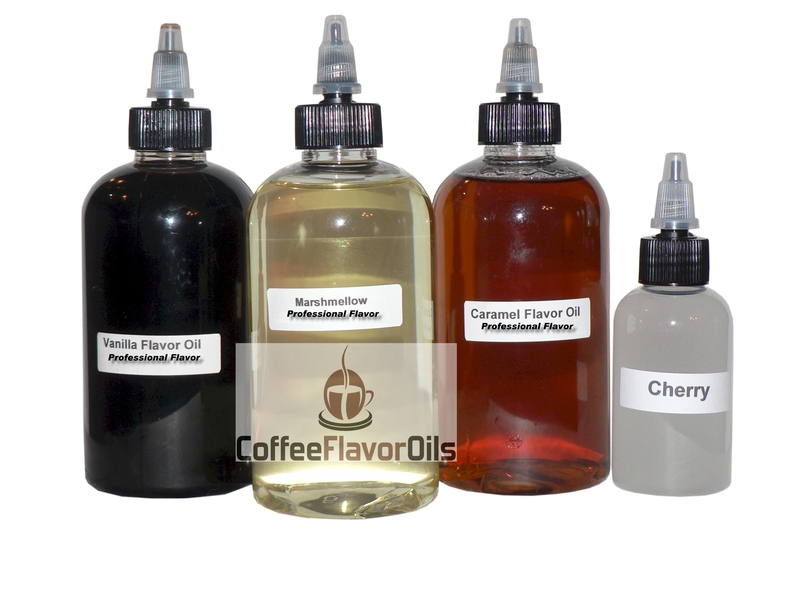 Used by professional roasters to flavor coffee beans our flavors are also great for flavoring candy, fudge *Very potent oils. Just a few drops per ounce of roasted coffee beans will do. For fresh roasted bean flavor (after CO2 has escaped) toss in 1/10 of an ounce of flavor to one pound of beans and let air until absorbed (about 2 hours.) You can add more to fresh roasted coffee beans for real flavor boom! Order Below on this same page. Personal Home Roasters Please Click Here Our concentrated coffee bean flavors are non-alcoholic. For your convenience click here for a printable one page coffee bean flavor list and bestsellers are in bold, but please use this web page to order. Almond Delight Coffee Bean Flavor Oil Almond Vanilla NEW! Highlander Grog Coffee Bean Flavor Oil Holiday Grogg NEW! Mocha Coffee Bean Flavor Oil Mudslide NEW! Great for dispensing just one drop or in a hurry or straight pour. To buy smaller bulk Coffee Bean flavor sizes please click here. International buyers must add to cart intl ship fees located in this link. Taste of filo dough, honey, ground walnuts oozing with spices. This is an almond and vanilla flavored birthday cake and a very special blend. Milk, honey and almond nougat. A staff favorite. - An outstanding blueberry that is not dependant on grape. Our blueberry is multifaceted and reaches the top “blue” notes you expect from a true good blueberry. It is more delicate than our “Wild Blueberry.” Both formulas are loved and sell equally as well. Bourbon Vanilla, layered with Caramel in milk with a shot of espresso, just as it should be. This is a sophisticated chocolate blend offering two versions of chocolate you shake well before each application. It is equal in intensity as a chocolate lava cake. This will enhance a regular coffee beans flavor. Warm, caramel tones with a rich essence of Macadamia nuts. A unique combination that will please the palette with the mild taste of roasted grains as well as the fatty tropical nutty smooth flavor of Macadamia nuts are known for. - A creamy cool peppermint flavor to reminiscent of holiday candy canes. - Make it an evening to remember with this Peppermint Mocha. Think dark chocolate syrup and peppermint flavor to perfectly compliment to bring in a comforting flavor. - Vanilla, White Chocolate and Peppermint makes this pig develop wings and fly! A holiday classic. - Creamy Coconut, Pineapple and Rum blended together to resemble the popular tropical favorite sweet cocktail. A propriety blend of nuts, caramels, and a hint of coconut. Strawberry comparable to “Mento's” candy. For a new bold strawberry please see our “Strawberry Jam” and “Wild Strawberry”. Sweet Cream has long been a favorite on our flavor menu and a flavor like the “Italian Sweet Cream” coffee creamer. It is also a great mixer for inspiring minds. A very good milk chocolate type folded in almonds. Espresso, Rum and Cream dominate this masterpiece. Primary notes are custard, caramel and vanilla.